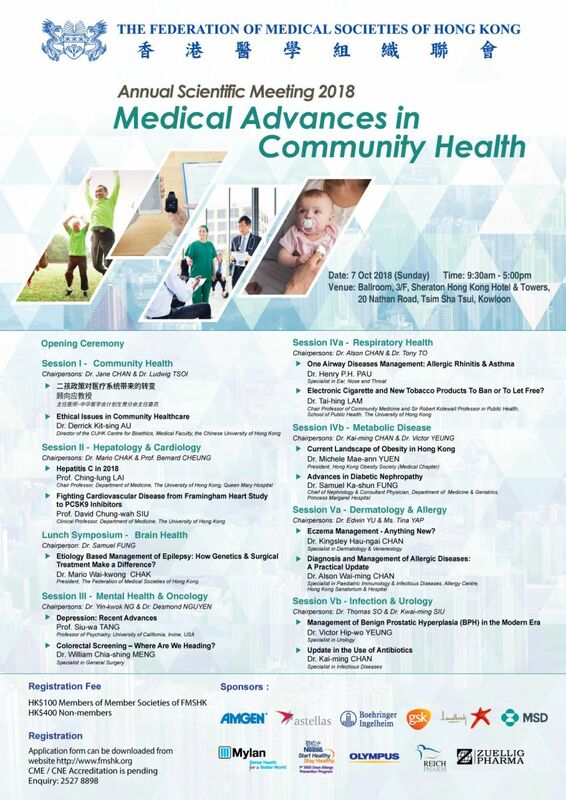 On 7 Oct 2018, the Federation of Medical Societies of Hong Kong successfully held the Annual Scientific Meeting 2018 at the Sheraton Hotel and Towers, with the theme of “Medical Advances in Community Health”. A total of 15 medical talks were delivered by a panel of distinguished speakers. They shared with us the latest knowledge and developments for Community Health, Hepatology, Cardiology, Brain Health, Mental Health, Oncology, Respiratory Health, Metabolic Disease, Dermatology, Allergy, Infection and Urology. FMSHK was much privileged to have the Officiating Guest, Prof the Hon Sophia CHAN Siu-chee, JP, Secretary for Food & Health Bureau, 宋瑋副部長, Representative of the Liaison Officer of the Central People's Government in Hong Kong SAR, 顧向應教授, Representative of the Chinese Medical Association, Dr. Constance CHAN Hon-yee, Director of Health, Prof. Hon Joseph LEE Kok-long, Legislative Council Member, Dr. Hon Pierre CHAN, Legislative Council Member – Medical, Dr LAU Chor-chiu, Vice President of the Hong Kong Academy of Medicine and Dr the Hon Che-hung LEONG GBM, GBS, OBE, JP, to officiate the opening ceremony. Professor CHAN and the Honourable Guests showed us the 9 different symbols representing different aspects of medical advancement, namely, Technology and Innovation, Mental Health, Exercise, Medicine, Scientific Research, Quit Smoking and Alcohol, Genetic, Healthy Eating and Health Professional. We would like to take this opportunity to express our sincere gratitude to our Officiating Guest, Honourable Guests, Co-chairmen, Chairpersons and Speakers for their contributions that made the event a great success. Our gratitude also extends to various sponsors for their generous support. We look forward to seeing you in our Annual Scientific Meeting in 2019!